This charming gypsy can see your future, and it's full of fun! Gypsy Spell Teen Costume includes a cute multicolor gypsy dress with gathered arm sleeves, attached hip stash with fringe detail, and a head scarf. 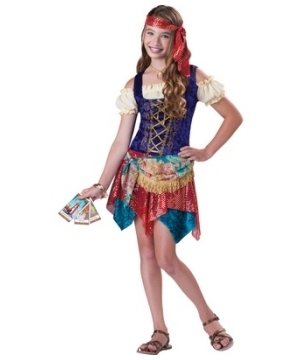 This cute Gypsy Costume for girls is available in teen sizes Small (8-10), Medium (10-12), and Large (12-14). Please note shoes, jewelry, and tarot cards are not included. Review(s) for " Gypsy Spell Teen Costume"